Natural gas offers maximum efficiency for heating your home during the cold months, fueling a barbecue grill on the patio during the summer, or drying your clothes. Like any utility, it’s essential to ensure that the gas pipes that safely provide natural gas to your home are properly installed by licensed and certified gas pipe fitters, like Master Plumbing & Mechanical. 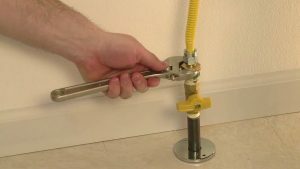 Master Plumbing & Mechanical’s technicians are highly trained and fully certified to install gas pipes in line with the latest industry standards. When properly installed by an expert, natural gas can be one of the safest and most efficient utilities for making your home more comfortable and useful. Natural gas is the solution for a wide range of functions in modern homes, from “>boilers, to water heaters, stovetops to outdoor grills, indoor and outdoor fireplaces, and even backup generators. Flexible gas piping installed to gas-tight standards can ensure decades of worry-free natural gas delivery to your home. Occasionally, especially with older gas pipes, regular maintenance and even repairs can become necessary. Our technicians are trained and prepared to diagnose and resolve any problems, including leaking pipes, with the gas lines in your home. Additionally, annual inspections and safety tests can prevent the need for costly repairs. Our technicians are trained to the latest standards and regularly updated so that they can respond to any natural gas emergency in your home. However, if you suspect a gas leak in your home, call your gas company immediately. As fall approaches, it’s especially important to have a trained technician perform a routine safety and maintenance check on your gas pipes and systems so that when the cold of winter rolls in, you can relax with the comfort and peace of mind that your natural gas system is operating at full capacity and efficiency. A recent study by the American Gas Association determined that using çnatural gas to power many major appliances could save the average homeowner up to more than $1,000 per year as compared to other common consumer energy sources. The study should be especially compelling to consumers, after last winter saw historically low temperatures for an extended period of time, leading to record demands for home heating. Furthermore, natural gas has been proven to be significantly safer on the environment as compared to electric appliances. Master Plumbing & Mechanical services the Washington, D.C. metropolitan area. Contact us for more information about gas pipe installation in your home.